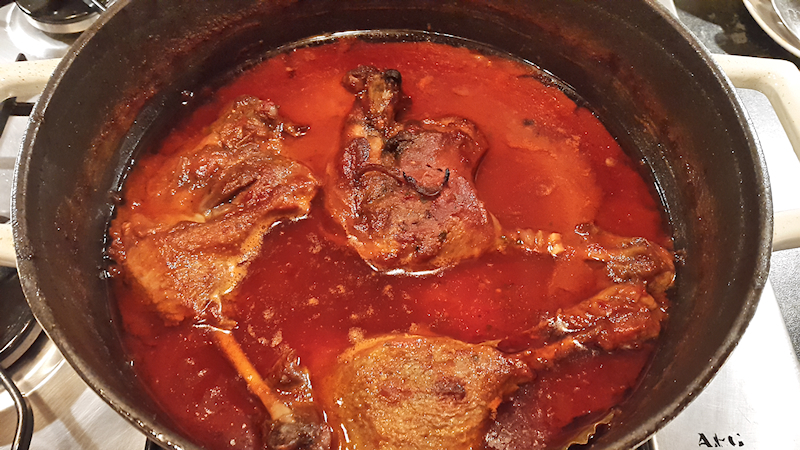 A recipe for duck legs in spicy tomato sauce. Served on top of spaghetti, it’s the famous Pastitsada from Corfu. Corfu is an amazingly beautiful island in the Ionian sea, close to Albania and Italy. During the past few centuries, it has been the target of several empires and powerful nations and their influences are still visible on the island today. More recently, it has been the target of holidaymakers and drunk British teenagers. But this another story. 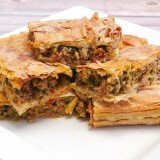 Along with the beautiful beaches and landscape, Corfu is famous about its cuisine. I have already given you a glimpse of it with the delicious Sofrito. Another famous dish is Pastitsada, a delicious stew with a rich tomato sauce and a handful of spices. 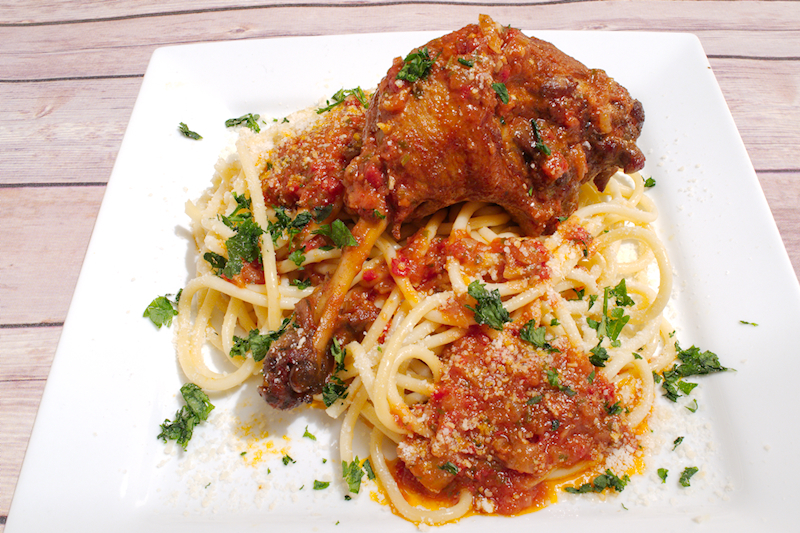 The main ingredient in Corfu’s Pastitsada is usually a free-range rooster. For those of you who haven’t tried rooster think about it as a tastier chicken. 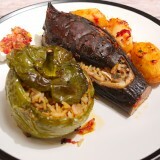 However, Pastitsada can be done with other kinds of meat, like beef or chicken. 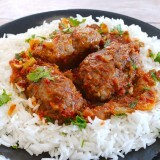 It’s originality lies in the thick and spicy sauce. Apparently, in Corfu you can find the blend of spices for Pastitsada in local pharmacy stores! I think that’s quite funny. A nice blend of cumin, cinnamon and nutmeg will do the trick as well. Cloves and bay leafs are also necessary. Pastitsada is usually served with thick and hollow spaghetti-type pasta so that the sauce enters into the hole and gives you an awesome palate experience. I used bucatini, which is just hollow spaghetti and it was great. Don’t forget the generous amount of Parmesan on top! 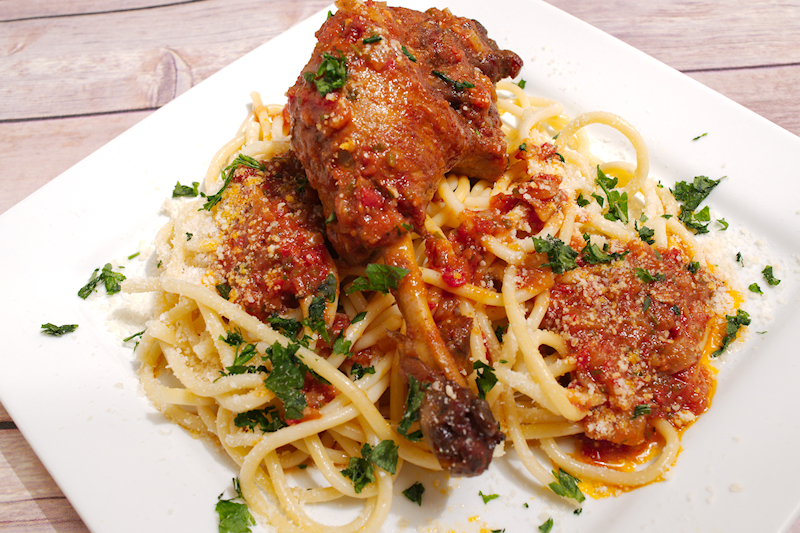 A recipe for duck legs in spicy tomato sauce. 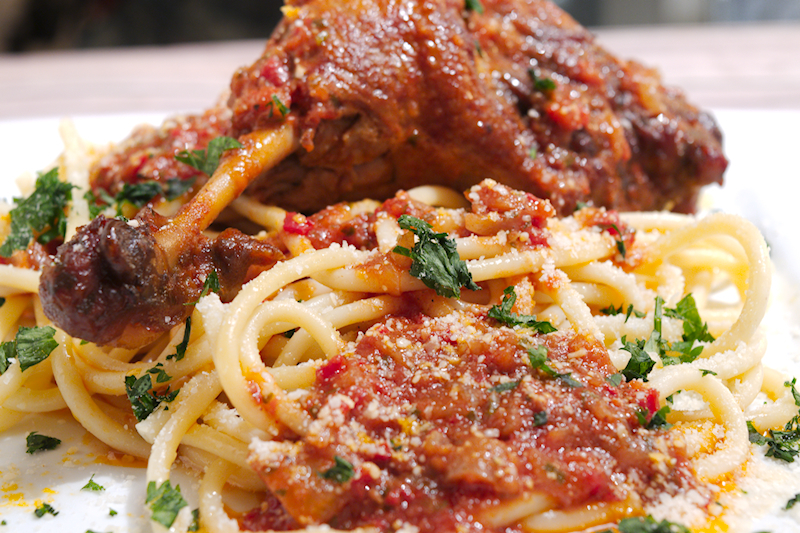 Served on top of spaghetti, it's the famous Pastitsada from Corfu. 6 duck legs with skin on. 750 gr (26 oz) spaghetti or bucatini. 2 medium yellow onions finely chopped. 3-4 large sweet and ripe tomatoes. 3 garlic cloves finely chopped. 500 ml (17 fl oz) tomato passata or tin tomatoes. 1½ cup extra-virgin olive oil. Wash the duck legs and dry them very well with a kitchen towel. Heat up the olive oil in a deep pot or Dutch oven at medium-high heat. When hot, add the duck legs (start with with the skin facing the bottom first) and fry them until they get brown in both sides. Season slightly with salt and pepper. Remove from the pot and set aside. Depending on the size of your pot you may need to fry them in two batches. 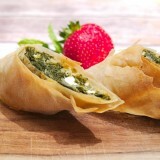 Add the fresh tomatoes and parsley in a food blender and make a nice paste. Reduce the heat to medium, add the onion and fry it until it starts getting brow. Use a wooden spoon and scratch gently the bottom of the pot to release the nice flavors. When almost done, add the garlic and cook for ~ 30 more seconds. 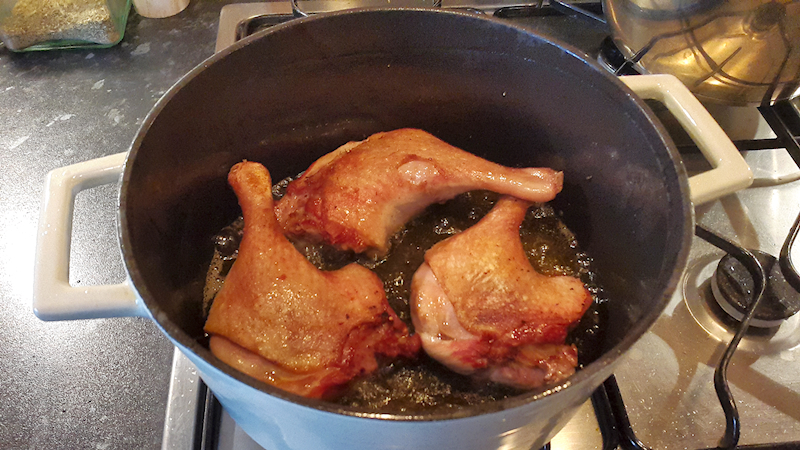 Add the fried duck legs in the pot and give it a gentle stir. Add the cumin, nutmeg, cinnamon, paprika and season with salt and pepper. Add the wine and bring it to boil. Let it cook for ~ 2 minutes and add the fresh tomato paste, passata, cloves and bay leafs. Make sure the duck legs are almost covered with the juices. Reduce the heat heat to minimum, cover with a lid and let it cook for ~ 90 minutes. 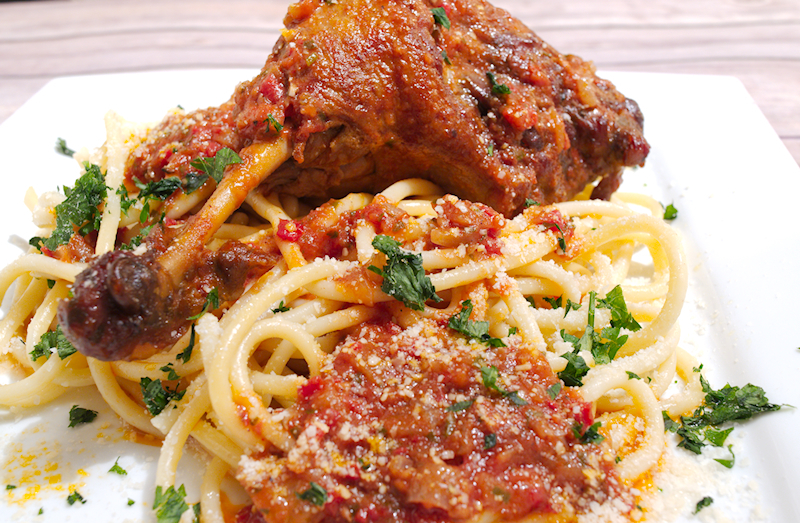 Pastitsada is ready when you are left with a thick sauce and the meat falls from the bone. If you want a nice brown color, you can place the pot in the oven without the lid at 180 Celsius (360 F) for ~ 20 minutes. Boil the pasta according to the instructions on the box (preferably “al dente”). Before draining, save one cup of the pasta water. Drain the pasta and add ½ cup of extra-virgin olive oil in the pot you boiled the pasta. Heat up the oil on low heat. Add the pasta to the pot and give it a good stir. Add some of the reserved pasta water and stir well so you can have nice, oily and creamy spaghetti. Serve the Pastitsada on top of the pasta with lots of sauce and Parmesan cheese.